The Pivithuru Hela Urumaya (PHU) today said the people have voted for the Sri Lanka Podujana Peramuna (SLPP) at the Local Government election to rectify the mistakes they have made on January 8 Presidential election. 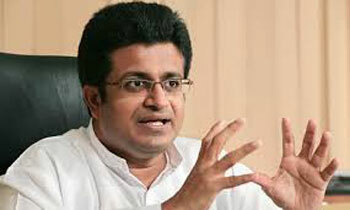 Addressing a news briefing, PHU Leader MP Udaya Gammanpila said the people’s mandate, which was given to the SLPP, was not a mandate given to deliver the promises made on January 8 when President Maithripala Sirisena assumed duties. He said if the people wanted to get the January 8 promises fulfilled, they should have voted for the Janatha Vimukthi Peramuna (JVP). "Ministers and even NGOs who analyse this election results say people have gathered around the lotus bud because the government has failed to deliver its promises given on January 8. This is an illogical statement. If people are disappointed and wanted to get those promises fulfilled, they should have voted for the JVP which stands for that mandate. Our mandate is not the January 8 mandate," he said. He said people have rejected the United National Party, Sri Lanka Freedom Party (SLFP) along with the JVP by gathering around the lotus bud. January 8 Mistake - not punishing looters and murderers as promised. Bingo! Finally, one of our honourable politicos has got it! That is exactly what the people of Sri Lanka voted for in droves on February 10th which is as historical as the January 8th 2015 election in which for the 1st and now the 2nd time in our modern post-colonial history, Sri Lankans wisely used their vote to drive home sense into the respective presiding political leadership at the helm on each of those times. If the overwhelming majority of Sri Lankans voted for a party, whether you like it or not, don't assume you know better than they nor argue with the result - a veritable slap on your faces for not paying heed. Respect the basic epithet on which democracy is founded - the will of the people. It's a bitter pill to swallow but swallow it you must. But heads up: how you speak to people and what you do with public assets and resources from now on will determine your survival in a year or two. Act wisely. You're on the clock! You are servants, not saviours!
" they should have voted for the Janatha Vimukthi Peramuna (JVP)." - I fell off my chair laughing. Now when we hear or see a HORA we shout as HORA! This is because we have a freedom to do now! Under your era Pre-Jan 2015, we can hardly do that! Hence people will think this hard earned freedom vs what you have to offer! What are the big mistakes? Is it a mistake to restore democracy , rule of law, foreign policy, good governance, anti corruption drive, proper health and education facilities. Repayment of unnecessary lines and burdens etc.etc. Or may be you r right , we didn't put you put u all in jail and didn't strip civic rights..! When MR was selling the national assets you were having a nap.Now suddenly you woke up .Now You are telling Government is dividing the country. We do not see any division last three years .It is only an election propaganda by JO just to get some sympathetic votes. One man party leader seems to have New dreams. I did not vote this time because the govt made the mistake of not arresting the crooks promptly. It's still not too late. Hon'ble Gamman Pilla, those who do not like you when you speak pure truth, they are stereotyped by their masters.